So my six week adventure through Victoria, B.C., Flagstaff, AZ and Los Angeles, CA are coming to a close as I sit here in LAX waiting for my flight. All in all I had some great training, made some good friends and finished off with a successful season opener. So there ended up being 66 guys on the line last night! It was crazy at the start and I found myself in 20th place going through the first 400m in 69 sec. I quickly got into the top 6 and that pack stayed together for most of the race as we lapped many runners. I ran a 62 last lap to run 28:21.86 for 2nd place. 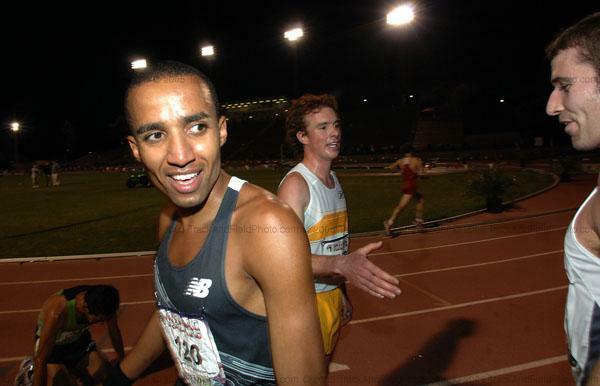 There were many good Canadian results last night, including Malindi Elmore, Megan Metcalfe and Beth Wightman running 15:12, 15;15 and 16:17 respectively for 5000m, Eric Kiauka ran 8:45 in the 3000m s/c and Kevin Sullivan 13:19 for 5000m (knocking my 5000m time back to 5th on the all-time Canadian list). The group also gave me great support for the entire 25 laps, thanks guys! But the action didn’t stop at the track. Since the race was at 10:30 pm it was about 11:40 by the time we (Eric Kiauka and Luis, our new Mexican friend) left the track looking for food. We had to head past our hotel and towards East L.A. to find something open at midnight other than In-and-Out Burger. We saw Tommy’s Burgers but a lot of thugish looking individuals on the picnic tables made us decide to keep on looking. We settled for T.G.I.Friday’s, a nice family establishment. Pretty normal place except there was a cop standing at the end of our booth for the first 20 minutes we were there. Five minutes after the cop left a brawl breaks out and everyone is watching. Then the chairs start swinging and others back off… the pint glasses and bottles start flying too. Glass is heard breaking everywhere for a bit and then the two parties settle to go outside, they all left carrying Corona bottles, a few with bloody faces. Once outside most of the restaurant patrons are at the windows watching. Many of the guys involved in the brawl head to their cars… must be over. Nope, they went there to get something and the staff is telling everyone to get away from the windows. We head back to our booth, we don’t need to find out what they were getting. We couldn’t believe how long it took the cops to come, considering how many cops were on the streets when we were driving. Needless to say we got an authentic LA experience. You can watch the last 3km here http://www.flocasts.com/flotrack/mtsac2007.php just scroll down to mens 10 000m on left hand side. ← Can you really put 72 guys in one race? Wicked race! So many dudes on the track! Certainly different than a Speed River meet at St. James. I’m glad you were wearing the pretty yellow shorts. You were easier to keep track of. Nice finish too. I guess that Olmedo went a little early…thinking he could hurt you by going at 300m left? If he had seen your skateboard mile, he probably would have a different race strategy. What’s next? do you have any 5000s scheduled? If Guelph is pleasantville…what is LA? Congrats, Reid! Great race – looking forward to seeing some more of your talent showcased this season. Well done!